The events in this true story took place in the 1990s. we always receive the guidance we requested. One day Echo came in from pasture with muscle spasms in her mid-back. When I asked what had happened, she showed me the incident like watching a movie. Two horses had chased her. As she ran up a slope on wet grass, her hindquarters slipped sideways and hit the ground, twisting her back. As a result, some vertebrae were stuck and the muscles were in spasm. Luckily, there was a veterinarian trained in acupuncture nearby. Acupuncture can relax the muscles, reducing the spasms. Sometimes this allows the spine to correct itself. Sometimes. Other times chiropractic is required. Echo needed both and it took six months to get her to a veterinarian trained in chiropractic. 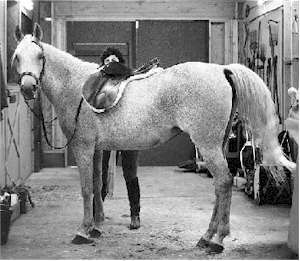 Even with spinal adjustments, there remained a soft lump on Echo’s back right behind the saddle area. The veterinarians diagnosed a cyst that they said would never go away. I observed it changing shape from time to time, but it did not get smaller. Eighteen months later, I began teaching myself about energy healing by looking for the primary chakras in Echo’s body. A chakra is a wheel or vortex of spinning energy shaped like a cyclone. When working properly, the physical body receives life force through the chakras and sends out energies that need to leave. In humans and animals there are 7 primary chakras located along the spine. You can learn to feel for the presence of a chakra by bringing your hand, palm down, in a sweeping motion towards the spine, and then swooping it back up again. As I moved my hand in this fashion, I began feeling different sensations. With patience, I soon identified the locations of six of the seven chakras along Echo’s spine. Since I was able to feel the energy, but not see it, I kept using my hands to feel Echo’s chakras at various distances above her body. A chakra’s 3-dimensional appearance is like a cyclone, narrower at the base and wider at the top. At three inches above Echo’s back I could feel the top of each chakra and the swirl of the energy within. Echo’s 3rd chakra was located directly over the lump. As I felt the top of the chakra at its widest point, I sensed that a part of it was sticking up higher than the rest, like a funnel within a funnel. I remembered seeing a drawing in Barbara Brennan’s book, Hands of Light, which illustrated what I was feeling with my hands. I now knew that this chakra was damaged. I wondered, “How do you fix this?” I was guided to “plant the root”. So, using my imagination, I grasped the piece that was out of place in my hand and pretended to put it back where it belonged, inside Echo’s body. I knew that I couldn’t literally place my physical hand into Echo’s physical body, but I allowed myself to believe that I was doing it. Then I felt the top of the chakra again. It felt completely normal. Two weeks later, the lump on Echo’s back had completely disappeared, never to return. I was amazed, excited, and bewildered, all at the same time. Had I actually fixed the problem? If so, how had I known what to do? When I shared this story with Reva, the woman who gave me healings, she explained that all energy work is performed with the help of spirit guides who are experts at healing. She encouraged me to meet mine. That evening I asked to meet my guides. Immediately, I saw in my mind three beings. One looked like a Caucasian male dressed in a toga. The second looked like a Native American kachina, with a hawk’s head. The third was an African whose clothing kept shifting from tribesman to western suit. Only the first one spoke to me, or he was the only one I could hear. I asked them to work with me and heard that they were eagerly awaiting my request for their assistance. Since this experience, I learned to work from a distance with humans and animals. I work with many guides and healers from the higher realms. What I know is that I'm not the one doing the healing. I'm a facilitator and coordinator of healing times. Because I'm in a physical body, there are things I can do that healers in the higher realms cannot do at this level, but there is far more that they can do. The results cannot be predicted, as it's up to the person receiving the healing how the energy is used.